AHARS regularly holds Foundation courses and upgrades at the 'Shack', located at the Girl Guides Hall at Hannaford Road Blackwood, immediately behind the Hungry Jacks car park. The Foundation course is held over the duration of a weekend. The Saturday consists of the full Foundation course training and will run from 9am sharp, through to about 5pm. The Sunday morning is a revision of course typical questions, with the examinations being held at the completion (usually about 11am), which is then followed by the practical exam. Please contact the Clubs training officer, Sasi VK5SN by sending an e-mail to vk5sn@wia.org.au and let him know that you wish to attend. He will send back a confirmation of what you require to bring along and any other information that you may need. UPGRADE exams are also held on the Sunday, again contact Sasi to book your self in for these. Contact your trainer to confirm examination venue and other details. The Club normally holds Foundation courses and other examinations on a quarterly basis and are usually held at 'The Shack', located at the Girl Guides Hall at Hannaford Road Blackwood, immediately behind the Hungry Jacks car park.. 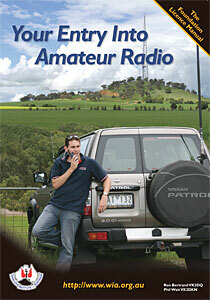 Relevant Study Book - "Your entry into Amateur Radio" The Foundation Manual - Third Edition which is available from the WIA, most Clubs and training officers. Any other required Foundation Course or material will be sent to you on registration with our Training Co-ordinator. Application for subsidy to be made within 12 months of completing the examination. A maximum payment of $50 will be made after 12 months of continuous financial membership. Successful exam candidates – see Membership Fees above. See document Claim for Subsidy of study fees-2 for information relating to subsidies and charges. To Standard and Advanced Licences. See document Claim for Subsidy of study fees for information relating to subsidies and charges. To be held at 'the shack', behind Blackwood Girl Guides Hall, Hannaford Road, Blackwood, S.A.